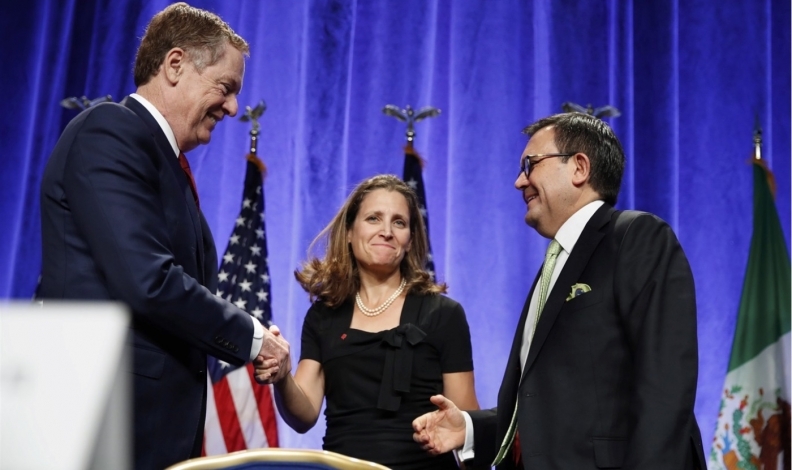 WASHINGTON -- The ministers leading NAFTA negotiations wrapped up the latest round of high-level talks after Canada and Mexico rejected what they see as hardline proposals by the U.S.
Mexico and Canada have repeatedly and publicly rejected the U.S. demands on dairy, autos, dispute panels, government procurement and a sunset clause. Officials familiar with the discussions describe two tracks to the negotiations -- an impasse on a few of the most contentious proposals, and progress being made on updating the pact in other areas. President Donald Trump has called NAFTA a disaster and repeatedly threatened to withdraw the U.S. from the agreement, a step the White House can set into motion by giving six-months’ notice to its trading partners. At stake is the $1.2 trillion in annual trade between the three countries, as well as the business models of companies such as Ford Motor Co. and General Motors that have adapted their supply chains to take advantage of the trade zone. The increasingly tense tone of talks has fuelled speculation that Trump will make good on threats and walk away. Declines in the Mexican and Canadian currencies are among the biggest of major world currencies in the past month on concerns that an end to NAFTA could crimp economic growth.